Thank you for visiting our web page. We have one of the country's three most extensive showrooms, with a very knowledgeable sales and teams. 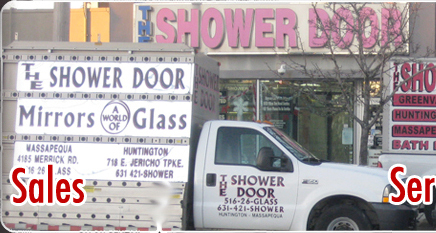 We feel your shower door installation should be a memorable and joyful experience performed by our trained shower door technicians. their own using drop clothes from your entrance to your job. You are not just purchasing a shower door you are buying an installation and receiving service for the life of the unit to the original owner. 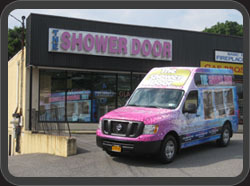 In most cases shower doors in stock can be installed the next day. Our installations are performed 6 days a week to try to accommodate our customers busy schedules. Today's shower doors are much more intricate and do require service from qualified installers. You we will always be able to contact a real person 7 days a week during business hours. We also sell doors from our extensive stock to Contractors and the public. Our discounts range from 30% to 60% off manufactures list price. We ONLY carry the top line of doors which all come with manufactures warranties ranging from one year to lifetime. We do not service what we do not install, but if you purchased the door from us we will fully assist you in getting the parts you need for the life of your door to the original owner. 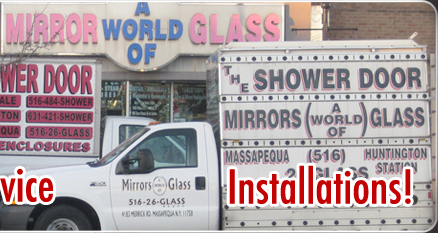 Over 100 years in the glass & mirror business. In the early 1900s when glaziers wore shirts with collers and ties Joseph Hill was the first generation. He was a charter member for one of the first Glaziers Union # 1087 his was the eleventh name on the charter. Copyright by @ 2009 The Showerdoor. all right reserved.